PRICE INCLUDES LASER ENGRAVING! 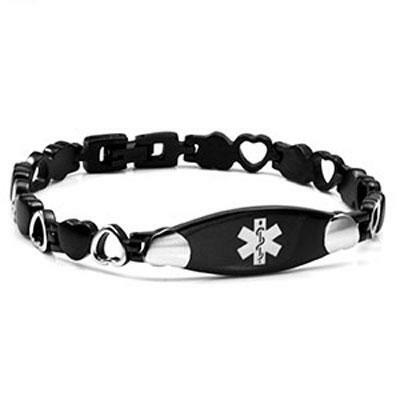 This Satin Heart Black Satin Medical Bracelet will wow you! Our sleek and fashionable band has a satin finish with glistening silver-tone accents sure both you and your medical information are noticed! This style is classically elegant with the durability to be worn every day. 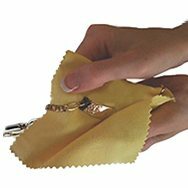 Made entirely of stainless steel this bracelet can be worn without worry of excessive tarnish or reaction to water. Medical ID Tag Measurements (in inches): L 1.75 X H5. Plate Material: Plated Stainless. Our triple heart silhouette fuses filigree detailing with a cool vibe to create this fabulous look! Fits wrist 6 - 7-1/2 inches (6-inch wrist will be a loose fit) Laser engraving on the back is done in an UPPERCASE block font.